Springy, sweet, and puffed full of air, marshmallows as we know them are a pretty unnatural (albeit delicious) treat. It turns out, though, that the campfire-friendly confections originated thousands of years ago with the most basic of ingredients. Start with the fact that the marshmallow is actually a plant. Found mostly in Europe and western Asia, Althaea officinalis grows as high as six feet tall and sprouts light pink flowers. A member of the mallow family, it grows mainly in wet or marshy areas—and thus, "marsh" meets "mallow." 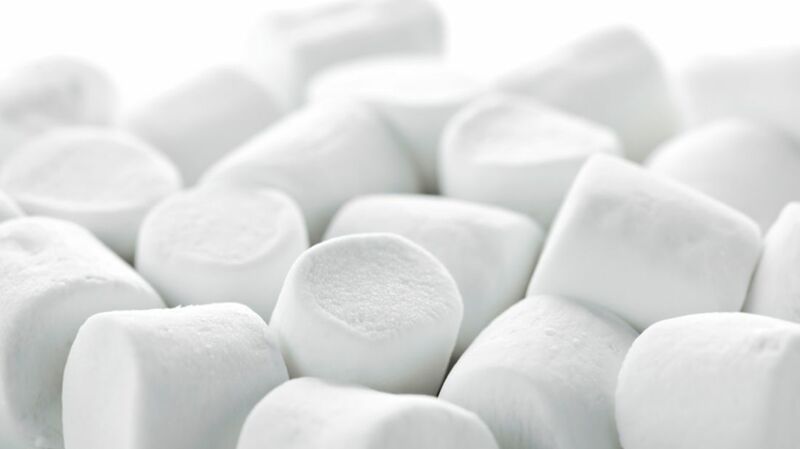 Beginning around 9th century BCE, the Greeks used marshmallows to heal wounds and soothe sore throats. A balm made from the plant’s sap was often applied to toothaches and bee stings. The plant’s medicinal uses grew more varied in the centuries that followed: Arab physicians made a poultice from ground-up marshmallow leaves and used it as an anti-inflammatory. The Romans found that marshmallows worked well as a laxative, while numerous other civilizations found it had the opposite effect on one’s libido. By the Middle Ages, marshmallows served as a treatment for everything from upset stomachs to chest colds and insomnia. The Ancient Egyptians were the first ones to make a sweet treat from the plant, when they combined marshmallow sap with nuts and honey. The dish bore no resemblance to today’s marshmallows, and was reserved for the nobility. The gods were supposedly big fans, as well. For centuries afterwards, the plant served as a food source only in times of famine. In contrast to the marshmallow candy, the marshmallow plant is tough and very bitter. In 19th century France, confectioners married the plant’s medicinal side with the indulgent qualities revealed by the Egyptians. Pâté de guimauve was a spongy-soft dessert made from whipping dried marshmallow roots with sugar, water, and egg whites. Sold as a healthful treat in lozenge and bar form, the guimauve, as it was known, quickly became a hit. There was just one problem: Drying and preparing the marshmallow stretched production to a day or two. To cut down the time, confectioners substituted gelatin for the plant extract. With production streamlined, marshmallows made their way to the U.S. in the late 1800s. Soon after arriving, the recipe was tweaked to make marshmallow crème (which, in keeping with the marshmallow's health food origins, was once advertised as a wrinkle cream). In 1927, the Girl Scouts Handbook came out with a recipe for "Some More." It instructed readers to "toast two marshmallows over the coals to a crisp gooey state and then put them inside a graham cracker and chocolate bar sandwich." The name was soon shortened, and s'mores have been an American campfire tradition ever since. The next leap for marshmallows came in the 1950s, when manufacturer Alex Doumak developed a process called extrusion that forced marshmallow mixture through metal tubes, shaping it into long ropes that were then cut to uniform size. The process gave marshmallows their cylindrical shape and it pumped even more air into them, giving them the soft-but-firm quality that we associate with the treat today. Kraft’s "Jet Puffed" tagline rebranded this process, which subjects the marshmallow mixture to gas blasts at 200 pounds per square inch. Thanks to the wonders of industrial processing, Americans today consume more than 90 million pounds of marshmallows every year. Companies now make all-natural marshmallows using vegan gelatin and alternative sweeteners. You can also make your own marshmallows with some corn syrup, granulated sugar, gelatin, and a few other ingredients. If you’ve got time and the right equipment, you can even make marshmallows the really old-fashioned way, using marshmallow root. Step one: "Make sure the marshmallow roots aren't moldy or too woody." Good luck with that!